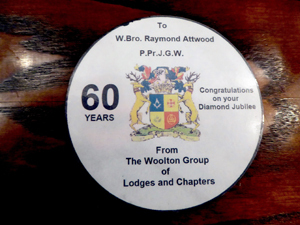 Whenever a brother celebrates a milestone in their career it is always a very special occasion and for Raymond Attwood on his 60th anniversary in Freemasonry, this proved to be the case. The WM of Olympic Lodge No 4461 Stephen Cornwell, which meets at the Geoffrey Hirst Masonic Suite at Woolton Golf Club, opened the lodge in due form and quickly ensured that the minutes of the previous regular meeting were confirmed and signed. The Deputy Grand Director of Ceremonies Ian Halsall, informed the brethren that the Assistant Provincial Grand Master Kevin Poynton stood outside the door of the lodge and demanded admission. Kevin, accompanied by grand officer David Hawkes, acting Provincial grand officer Stephen Clarke and Group Vice Chairman Mike Cunliffe entered the lodge, where Kevin was warmly welcomed by Stephen and then offered the gavel, on this occasion Kevin was pleased to retain the gavel so that the celebrations could commence. Kevin occupied the master’s chair to provide the brethren with details of the celebrant Raymond Attwood. 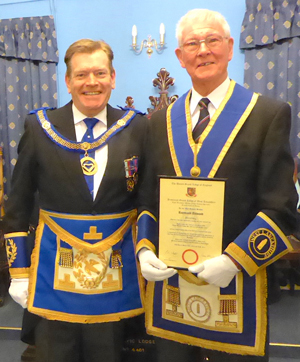 Kevin was pleased to be back in the lodge as it was only a few weeks before that he had been in attendance to celebrate a brother’s 50 year in Freemasonry. To provide background information, Kevin informed the brethren that the celebrant was born in 1934, when Ramsay McDonald was prime minister of the day, the Meccano factory was opened in West Derby, the Mersey Tunnel was opened by King George 5th and “cats eyes” were invented by Percy Shaw. Ian Halsall was requested to place the celebrant before Kevin and ensure that he was comfortable before proceeding. One of the things that Kevin had discovered in speaking with Ray, was that Ray’s father had been the licensee of the Prince Alfred Hotel in Wavertree, Liverpool and opposite it was the ‘Thatch’, which was run by Thomas Giltrap, who it turned out was the grandfather of Kevin’s wife Sue. Ray’s first schooling was at Holy Trinity Infants School in Wavertree in 1939, then because of the Second World War, Ray spent a short period of time at Lidderdale Road and Morrison’s Infant School at Greenbank Road. Ray was evacuated to his aunt’s home in Stockport, which was a bit of a waste of time because the bombers there were just as active, so he eventually came back to Liverpool to carry on his schooling. Rays dad had been a merchant seaman prior to the war and went back to sea. He was away for three or four weeks at a time, which was a big advantage in Ray’s eyes, for his dad came back with an endless supply of sweets, during a time they were on ration in Britain. As his dad was away, Ray’s mother ran the pub and during that time he and his brother were always kept busy, especially with the old-fashioned zinc bath in the cellar, which they had to fill with soda crystals and water. They would then mix and pump the solution through the old lead pipes and as there was no such thing as electric pumps they had to be drawn by hand to keep the pipes clear. This onerous, but vital operation had to be carried-out every two weeks, otherwise the beer would taste off. After the war in 1945, Ray moved on to Rose Lane Secondary School, where he played in the school football team. Ray was also a keen cyclist and very often would cycle all over the place, including frequent rides into Wales and back. After the war he and his family moved to a new pub called the Childe of Hale Hotel, in Hale village, where both he and his brother continued to work in the pub, moving the barrels and bringing up the crates of beer from the cellar to the bar on a very regular basis. In 1949 Ray took his first job with C.W. Fields, who made essences and flavourings and his first job was in the packing and dispatch department. Ray was there for about three years and the time soon came when he was going to be called-up for national service. But aware that conscripts would earn much less than enlisted men, Ray decided in 1952 that he would enlist in the Royal Air Force for a period of five years. Initially he went over to West Kirby for his basic training and after a bit of square bashing took the trade of wireless operator. For training he was sent to Compton Bassett in Wiltshire, then to Habbanya in Iraq for two years. This place was then just an Oasis in the desert and the nearest city was Baghdad. On returning to the United Kingdom in February 1955, Ray’s final two years were to be spent at 276 Signals Unit at RAF Digby, Lincolnshire. Whilst in Lincolnshire, Ray was monitoring Russian transmissions. This was called the MET scheme and Ray and his colleagues would monitor the Russians and they would monitor the British. Ray worked alongside people from Oxford and Cambridge University, passing the transmissions on to them, they in turn would pass the transmissions to GCHQ, it was all very hush hush. In 1957 Ray’s role in the Royal Air Force finished and he went back to civvy street, starting work at the Dunlop Rubber Company in Speke, as a traffic clerk. However, although he didn’t know it, he was about to meet Anita, the girl that would become his wife. By this time his mum and dad had taken the licence for the Five Ways Hotel at Childwall. His pal Rod had a sister who had married a chap called Derek, Derek was in fact Anita’s cousin. So, there was a bit of a ‘doo’ held for them all at the Five Ways Hotel and this was when he met Anita for the first time ‘properly’. However, there was a slight logistical problem, as Anita lived on the Wirral and in those days transport was a problem, as cars were scarce. Buses stopped at 10:00 o’clock and Ray had to get three buses to be able to see Anita. Their first date was to the Odeon picture house to see ‘Oklahoma’ and from there he never looked back. They were married on June 10 1961 at Saint Andrews Church in Bebbington and their very first home was to be a flat in Rock Ferry, but after a lot of saving, they moved into their own home in 1963, a bungalow off Chester Road, Warrington, which cost the princely sum of £1695 pounds, a lot of money in those days. In 1964 their daughter Nicola Jane was born and this was followed by the birth of their son David in 1966 and between them they have produced three granddaughters. In 1965 Ray changed jobs to a haulage company by the name of R.E. Nixon, at Whitley near Warrington and with this company he eventually achieved the position of depot manager. His next move came in 1968, when he moved to his present address in Widnes and in 1971 decided to look for a fresh job and moved to the Metal Box Company at Speke, where he was the assistant transport officer and eventually went on to be transport and warehouse manager. In 1990 he was offered early-retirement at the age of 56, so he took it and then started to play golf, do a bit of walking and some occasional jaunts in the caravan. Anita wanted to make sure he adjusted to retirement in his own time, so she stayed working, but eventually went down to three days. At this point Kevin outlined Ray’s Masonic career. Proposed into Freemasonry by William Pinder and seconded by T.C.Larkey, he was initiated into Apollo Lodge No 2042 on 10 March 1958, along with his father William, both on the same night. The lodge then was part of the Liverpool Sandon Group, which met at Hope Street. Passed to the degree of a fellowcraft on Monday 14 April 1958 and raised to the sublime degree of a master Mason on 12 May 1958. Through all three degrees he was accompanied by his father, who some time later, due to business commitments, was unable to continue and unfortunately had to resign in 1961. Ray introduced his brother Alan in 1961, but Alan was very heavily engaged with the finances of the company Rio Tinto Zinc and was unable to attend and he also had to resign. Sadly, Alan passed away some time ago. Ray was installed into the chair of King Solomon on February 18 1976 and continued through most of the offices, except those of chaplain, secretary and treasurer. But, being a glutton for punishment, he had another go in 1996, when on February 21 he was again installed into the chair of Olympic Lodge. That wasn’t good enough, as he became WM for a third time in February 2005. The Province honoured him for his work, when in March 1986 he was appointed to the rank of Past Provincial Assistant Grand Director of Ceremonies and then in October 1997, he was promoted to Past Provincial Grand Superintendent of Works and then again in November 2010, he was promoted to the extremely high rank of Past Provincial Junior Grand Warden. Ray celebrated his golden jubilee, marking 50 years as a Freemason on Wednesday March 19 2008 at Hope Street, when the principal presiding officer was Michael Hedley Hill, who went on to become Deputy Provincial Grand Master. The senior Deputy Provincial Director of Ceremonies on that particular evening, was a lesser well-known chap who afterwards really didn’t amount to much by the name of Kevin Peter Poynton! To mark this wonderful occasion and his continued efforts to the Province, the Provincial Grand Master Tony Harrison, had caused a commemorative certificate to be produced to help celebrate his 60 years in Freemasonry, which Mike Cunliffe read to the assembly and afterwards Kevin had much pleasure in presenting it to Ray. The WM was requested to resume the chair and presented Kevin with a cheque for £100 for WLFC. The brethren retired to the dining room for pre-dinner drinks and then sat to partake of an excellent festive board. Mike Cunliffe proposed the toast to Kevin, who duly responded by thanking Mike and the other grand officer for attending, together with the acting Provincial grand officer Stephen Clarke. Group Publicity Officer Colin Roberts, was also thanked. Fred Hulse proposed the toast to Ray, reminding him of days past. 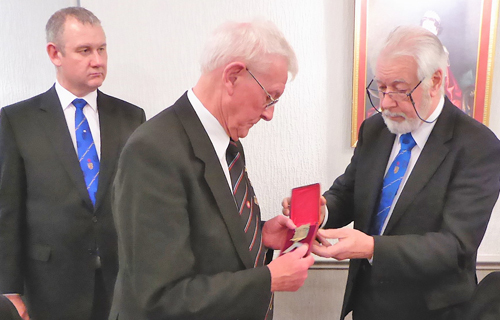 During Ray’s response, Brian Anderson had great pleasure in presenting Ray with a ‘Founders Jewel’ of Apollo lodge. An overwhelmed Ray thanked everyone for making the night one to remember and the final toast brought an excellent evening to a close.